1965 Ford Mustang Fastback 2+2 Show Car-Orig. 289 4V W/Edelbrock 650 Carb & Headers & Duel Flo-Master Exhaust-Rebuilt in 2010 w/1,000 miles, C4 Auto Trans, New BF Goodrich 18” Tires & Jesse James 44’s 18” Wheels. Rear Air Suspension, Power Steering & Brakes (Drum). $17K Paint Job done by House of Kolor in Colorado Springs (Chameleon Blue To Red) Plus Ghost Flames added by Fine Line & Design Colorado Springs. New Leather Interior Restored back to Factory Specifications. 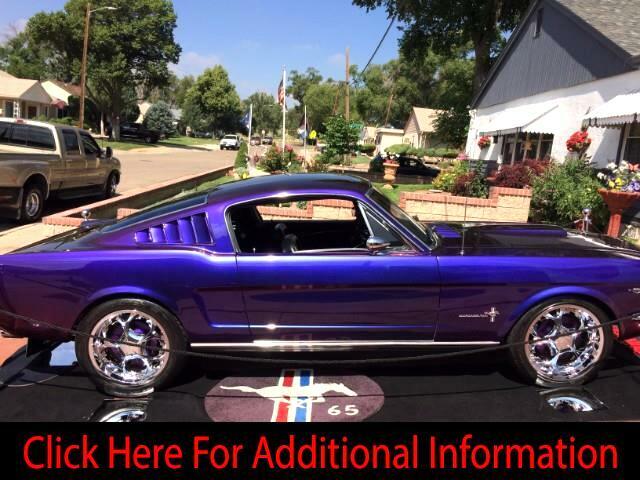 Car includes GT350 Hood Scoop, Shelby Mirrors, Harley Davidson Tri-Bar Headlamps, White-Faced Instrument Gauges, Triple Gauge Column Mount, Shaved handle doors, Red Neon Lights Undercarriage, Tinted windows, Sway Bar & Monte Carlo Bar, & Alarm System. Car is in perfect running condition and everything on the car works excellent. It’s been Garaged for the past 25 years and has won over 125 Classic Car Show Awards. There’s also a 2004 20’ Custom Built US Cargo Trailer specially designed to transport this car available for sale. It’s has 5K Twin Axles, Extra Wide Entrance & Curbside Doors for easy exit once the car is loaded. Trailer & Car can be sold separately.